“Challenge of a utopia, an integral strategy to save old Havana” is the title of a book about the restoration of Havana. 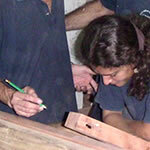 An innovative school for young restorers plays an important role in this strategy. 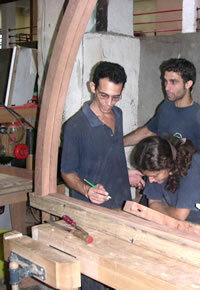 It prepares young people for the ongoing restoration activities in Old Havana, which is a UN patrimony of humanity. During their two-year apprenticeship they learn the theoretical and practical issues of restoration and also how to work and use different materials and tools that are not used nowadays. They learn the arts of masonry, carpentry, painting, glass craftsmanship, stone masonry, mural and gypsum painting for the restoration of the old damaged buildings. 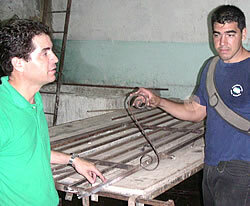 In the heart of the historical centre of Havana is the school for young restorers. The school-workshop “Gaspar Melchor de Jovellanos” prepares young people in the arts of masonry, carpentry, painting, glass craftsmanship, stone masonry, mural and gypsum painting for the restoration of the old damaged buildings. 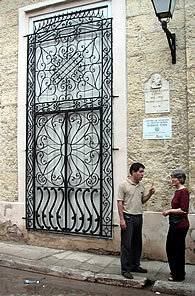 “Challenge of an utopia, a integral strategy to save old Havana” is the title of a book about the restoration of Havana. The school plays an important role in this strategy, since its foundation in 1992 it has occupied various buildings and actually it’s in the Calle Teniente Rey No. 15. The student’s restore the same building in which they study, once its restored they handed over to the office of history who uses it in different ways. Apart of restoring other buildings they also are occupied keeping the surroundings nice, with gardens, fountains, statues, murals, etc. In masonry for example, they participate in the rehabilitation of monuments, dismantle and collocation of beams, construction of brick and hollow block walls, floors, glazed tiles and welding. They build all the molds cornices and standing outs to be able to make the finish coating on the walls. Ejecutan revestimientos, construyen las cornisas, molduras y resaltos, y las terrajas para elaborarlas. They also learn to read and understand architectonical plans and projects, build forms for structural elements and also the wired body of them. During their two-year apprentice they learn the theoretical and the practical issues of restoration and also learn how to work and use different materials and tools that are not used anymore nowadays. The school director, Ing. Eduardo Gonzalez, is proud to announce that the majority of the young apprentices are from old Havana itself, they are females as well and they are between 18 and 21 years old. They are restoring their own district and at the same time learning old craftsmanship and historical applications of contemporary professions. The 100-120 students learn from recognized professors and have the great possibility to practice en places declared as UNESCO patrimony of humanity. At the same time they are being prepared to use their learned capabilities in the modern world, with a high level of skills, something that is not very common nowadays. The number of restored buildings grows almost daily and the historical centre takes more and more a character that shows the beauty of the architecture of the past centuries, incorporing the modern world.